Conventional discourse about the career of Louis Malle typically characterises him as an auteur in search of a theme. The more adverse of those commentators compare him with those individuals who constituted the longstanding animus of the nouvelle vague: the array of arguably faceless technicians who propagated the cinéma de papa such as Claude Autant-Lara and Julien Duvivier. True, like them, Malle might seem to flit from genre to genre, attempting work in the fields of science fiction, the costume drama, documentary, horror and farce, in addition to his more customary dramatic narratives. At the same time, he brought to his disparate efforts a recurrent interest in the untenable position of outsiders and a frequent fascination with the undeterred life force of adolescents faced by circumstances they can neither comprehend nor command. Nonetheless, a select few of his films more than eradicate any association of Malle with directorial anonymity, and Le Feu follet certainly stands pre-eminent amongst them. 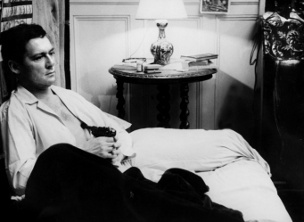 Adapted from a novella by the controversial Drieu la Rochelle (who committed suicide in 1945 following accusations of anti-Semitism and Nazi collaboration in WWII), it followed one of Malle’s most overtly commercial ventures, Vie privée (1961): an American-financed production featuring Brigitte Bardot and Marcello Mastroianni that proved to be a potential career setback as it accomplished little more than piquing the public’s fascination with the actress’s persona. Le Feu follet ventured in quite an opposite direction as it concerns the inevitable suicide of an ageing man about town, run down in debt, dependent upon his American wife for the expense of drying out and fearful that succumbing once again to alcoholism is all but inevitable. Malle had earlier attempted to construct an original scenario with suicide as its dramatic core, inspired by the loss of a close friend to the same circumstances. Stymied, he found in La Rochelle’s work of fiction a suitable framework, although he transferred the action to the present day. While not overtly autobiographical, as would be the case with the celebrated Le Souffle au coeur/Murmur of the Heart (1971) and Au revoir, les enfants (1987), Le Feu follet nevertheless has a curiously personal dimension, as Malle dressed his leading actor, Maurice Ronet, in his own clothes and stocked the bedroom in the arid private asylum where Ronet’s character resides with many of his own possessions. The sympathy Malle felt for his protagonist is further illustrated in an uncanny manner: photographs taken at the time indicate the undeniable physical similarity between actor and director. That sympathy comes across in Ronet’s masterful performance as the fatalistic Alain Leroy. Ronet had rarely before played such a psychologically complex individual, as many of the roles he had taken over the previous dozen or more years cast him in the position of male ingénue. Malle, however, both deduced and drew upon the resemblances between player and character. Ronet had experienced brushes with alcoholism and systematically abused his ageing good looks though persistent dissolution. When Malle contacted him to attempt the part, he was some forty pounds overweight, a burden the director required him to cast-off before he would allow filming to proceed. This parallelism between character and actor lends an added quotient of verisimilitude to the results, particularly in those scenes without dialogue in which Ronet exudes a kind of unabashed ennui. His affectless exterior alludes, without additional underscoring, to the vacuity that Alain has effaced through a kind of superficial bonhomie. The other characters with whom he comes in contact during the final days of his life embrace and enjoy the affable outward shell of his personality, yet while they acknowledge the taint of dissipation that lies just below the surface, few volunteer any assistance to dispel his undeniable tendency to self-destruction. Ronet effectively conveys both the glazed but genuine geniality that has allowed Alain to depend financially and circumstantially upon others all his life, as well as the subtly concealed core of negativity that comprehends the emptiness of his persistent course of action. Few other parts in the actor’s career either seemed so suited to his persona or stretched his capabilities so distinctively. Malle wisely chose to shoot the film in black-and-white and ingeniously incorporates location shot sequences from the streets of Paris. His compositions incorporate evocative elements and inhabitants of the circumambient environment, particularly in the sequences shot in cafes and outdoor eateries, yet effectively employs visually restrictive near close-ups that accentuate the facial expressions of his actors and convey the sometimes unverbalised thoughts of their characters. While Le Feu follet might lack the technical fireworks that characterises the work of some of Malle’s fellow participants in the nouvelle vague, its conventional, even occasionally stolid technique wisely recognises that the strength of the material lies in the characterisations and not some elaborated visual architecture that would, in the end, more than likely only draw attention to itself. It remains a timely and affecting work for this reason, as well as a successful showcase for Ronet’s personality. If anything does date Le Feu follet, though hardly irretrievably, it remains the overly familiar ambiance and attitudes that percolate through the Parisian demimonde that Maurice re-acquaints himself with before succumbing to his undeniable impulses. An air of what some writers at the time – Pauline Kael, in particular – objected to as a kind of “knee-jerk ennui”, insinuates itself into the sphere of intellectual banter, louche sexuality and middle-class sophistication Maurice encounters. When he objects that he cannot understand any of it or argues in his suicide note quoted in the last moments of the narrative that this act is intended to tighten the loose assemblage of his emotions and attitudes, one feels situated in an all too familiar territory consonant with contemporaneous works by Michelangelo Antonioni and Alain Resnais: a world in which, for all their efforts to abandon themselves to depravity and dissipation, the characters remain over-educated, over-indulged and over-sophisticated. One wonders why suicide must be presented as an inevitable if not potentially logical response to the smug certainty and seeming disaffection of an unchallenged social class. Might there be another, more ideologically persuasive resolution than self-destruction to a seemingly endless cycle of sensual distraction and personal indulgence?